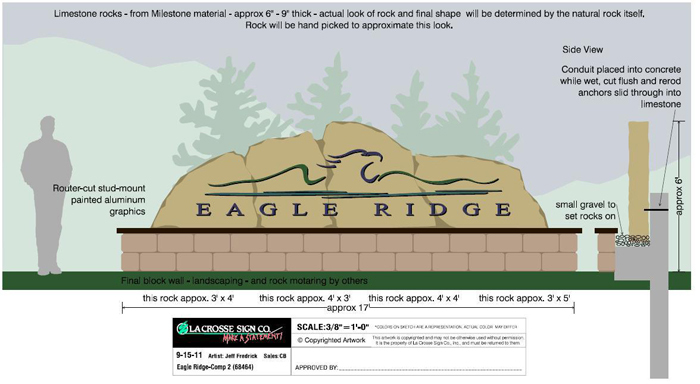 Eagle Ridge is pleased to be working with Lacrosse Signs of Lacrosse Wis. on our entry sign for the development at Eagle Ridge Country & Riverview Estates. We are finalizing the design now and would welcome your comments. This is what the front entrance sign to Eagle Ridge Country & Riverview Estates will look like. Click available property to see what lots are available for sale at Eagle Ridge Country & Riverview Estates. These lots have great views of the Mississippi River and are located near Lansing Iowa making it easy to go into town for quick shopping or a nice meal at many of the local businesses. For a list of businesses in the area of Lansing Iowa, click here.